A cold is very hard to shake off. Since Easter, I've had the dreaded cold bug which seems to have stolen away my taste buds completely. Everything I put into my mouth just taste like.....well nothing. I have not been making any effort to cook for almost a week and with all these constant on/off flurries of snow, I really craves for a decent plate of summery food that exudes a feeling of sunshine. Sometimes, that perfect dish need no more than five ingredients. It doesn't have to take forever to prepare and it doesn't requires you to slave over a hot stove, sweating away. All it takes is top quality ingredients. Once you have those at hand, everything else will follows. Take this simple dish for example. 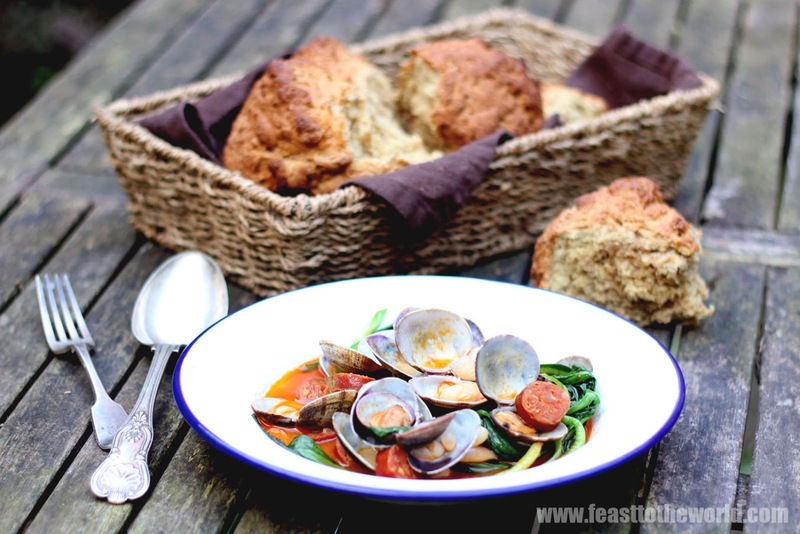 The main ingredients are some beautiful fresh Parlourde clams I got from Borough market. A good quality cured spicy chorizo along with tin cannellini beans. There is absolutely nothing wrong with using tin beans, especially when you lead a busy working and social life and all you really after is to have minimum fuss for that easy quick supper. A good bottle of white wine is also crucial for this. A glug for the pan and a well deserved glug for the cook. Amen! Now the fifth element to this is something that I rate very highly, even when compared to that glass of wine at hand, if that's even possible. Glug! Glug! The almighty wild garlic - a whiff of it announces the arrival of early spring and is something that I always look forward to every year. So it comes with no surprise that I would use this in every dish I can. So be warn, it will make frequent appearances over the next couple of months. 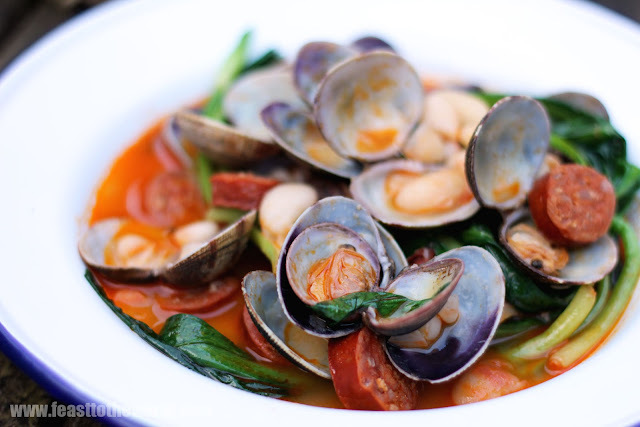 The finished dish, with sweet, salty clams bathed in a red smokey broth and hints of delicate garlic aroma is refreshing and is as summery as it comes. And the good news is.... even I can taste this! I'm on the mend. Hurrah! Wash and soak the clams in plenty of cold water. Change the water a couple of times to get rid of any grit or sand. Heat the olive oil in a deep pan over medium heat and gently fry the chorizo slices for 2 minutes. They will release some of their oil during cooking which will add flavours to the dish. Add the garlic and fry for 30 seconds. Drain the clams and add to the cooking chorizo, along with the wine. 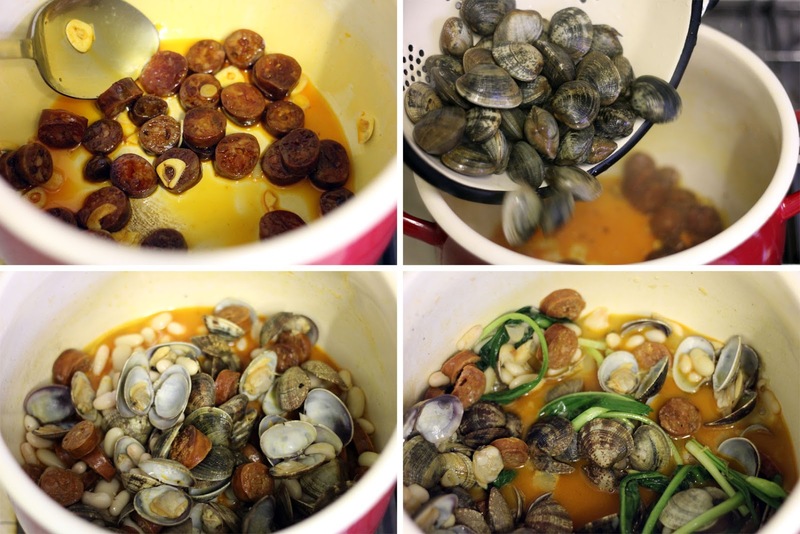 Place the lid on and cook the clams for 3-4 minutes. Add the beans and wild garlic and cook for another 1 minute until the beans are heated through and the wild garlic have slightly wilted. Season with salt and black pepper. Remove from heat and discard any unopened clams. Ladle into individual serving bowls and serve immediately with lots of crusty bread to mop up all the juices. See my soda bread recipe below. To go with this dish, I have made a very easy soda bread which although took a while to bake in the oven, in reality, takes no time to prepare at all. The missing yeast meant that that it eliminated the much dreaded proving process, which, lets be honest, can takes a long time. All that is required was to mix all the ingredients together and pop straight into the oven. The bicarbonate of soda within will do all the magic and give you a lovely, well-risen bread that is perfect for any quick supper. Preheat the oven to 220ºC. Sift the flour, salt and bicarbonate of soda into a large mixing bowl. Make a well in the middle and add the buttermilk slowly while working the mixture to form a soft but not sticky dough. You might not need to use all of the buttermilk. Turn out onto a lightly floured work surface and knead lightly, to shape it into a round dough. The bicarbonate soda start working the very minute it is mixed with the buttermilk so the kneading should not take more than 1 minute. Transfer onto a lightly floured baking tray and with a sharp knife, mark a deep cross before baking in the oven for 20 minutes. Turn the heat down to 200ºC and bake for another 25-30 minutes until the bread is done. To teat, turn the bread over and tap on the base, it should sound hollow. Transfer to a cooling rack and serve warm. 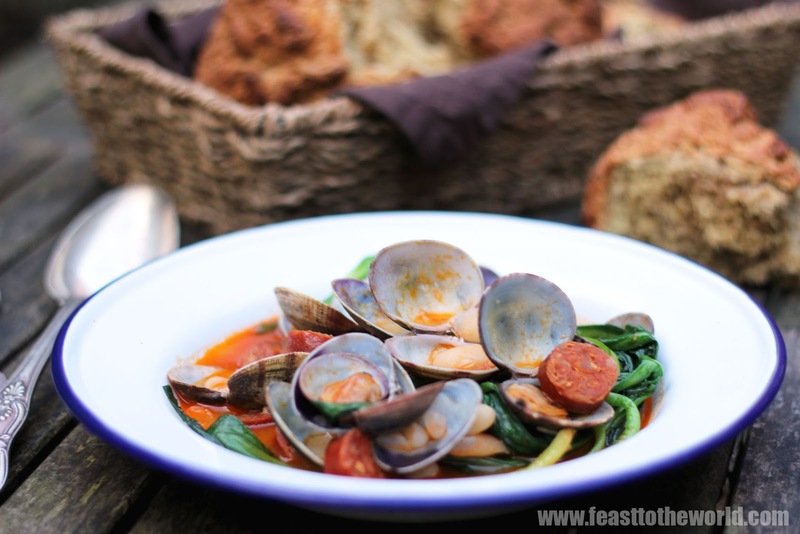 Love the simple idea of clams, chorizo, wild garlic and beans. Just what I feel like!